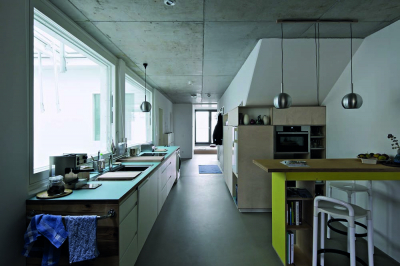 The main idea for the project, which was initiated by the architects ifau and HEIDE & VON BECKERATH in cooperation with the Selbstbaugenossenschaft Berlin eG, was to offer a mix of live and work units that would meet the needs of artists and creative professionals. 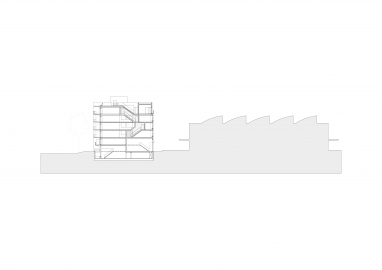 The starting point for the building’s layout and design was a collaborative and socially mixed utilisation concept. Moreover, the comparatively low land price allowed the cross-subsidisation of cooperative residential and studio spaces within the project, which can be let at a sustainable low rent. The decision-making process determining the development of a binding standard for fittings and the type and position of several communal facilities took place in close collaboration with the building group. 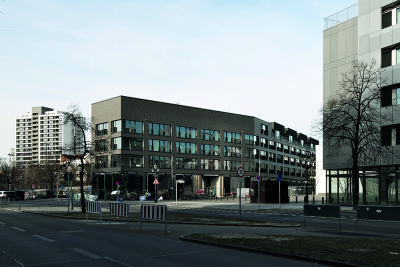 The site’s central location near Friedrichstraße suggests that the present mix of uses, which includes inexpensive housing in the neighbourhood, is at risk in the foreseeable future. 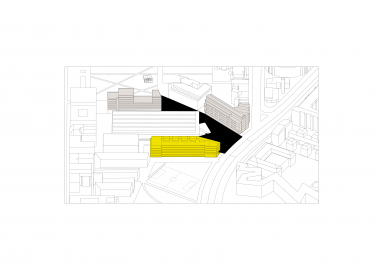 To redress this trend a concept-linked award procedure was launched for the flower market site and an innovative multi-stage qualification process was developed, whose aim was to support the ongoing project and assure the quality of architecture and urban development. 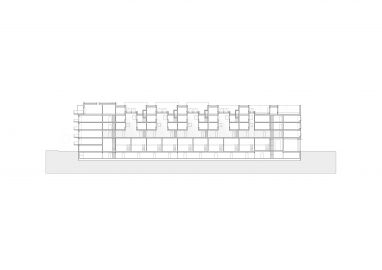 The architectural concept is based on three connected horizontal access cores as well as the relation between the building envelope and five internal atriums. 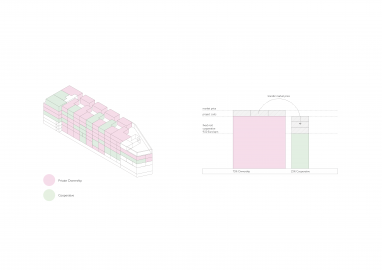 These parameters describe and inform the type of units and integrate the building into the neighbourhood. 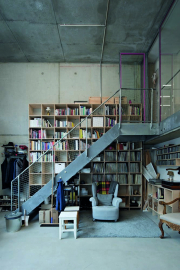 The access at ground level accommodates access to various studios, a garden, communal utility rooms and a basement. The access on level 1 is linked to green atriums and provides access to apartments on two levels. 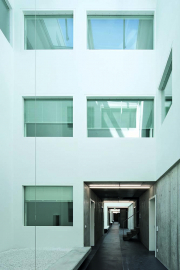 Another access route is situated on level 4 as well as a shared space and a roof terrace. 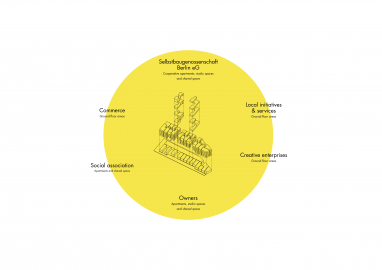 All apartments and studios can be combined and some of them even linked directly in the design development stage to adapt the spatial concept to the occupiers’ needs. The structure is a combined cross-wall and column construction. 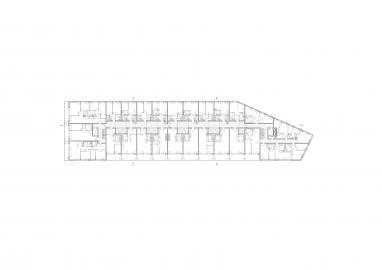 The underlying principle is that units in the centre of the building are arranged in modules over a depth of 23 m while units at the ends of the building relate to their surroundings. 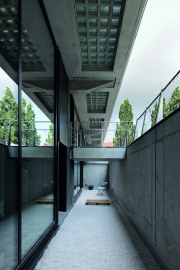 All ground floor spaces are transparent and can be extended into the adjacent public areas. The building envelope combines ceramic elements, windows and fixed glazing in its facade. Generous prefabricated balconies are situated in the south and west. The building is designed with cost-efficient prefabricated components and could be mostly constructed to the energy efficiency standard 70 of the German Energy Saving Ordinance using mainly environmentally sustainable building materials. Access concepts and floor plans are flexible to accommodate possible conversion and retrofitting as well as adaptation to changing demands. 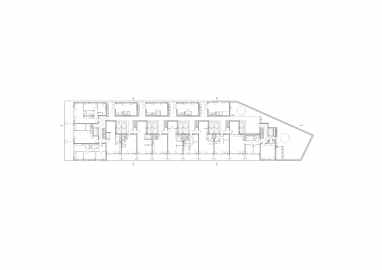 The design of the floor plans for the 66 apartments is both demand-based and user-oriented. 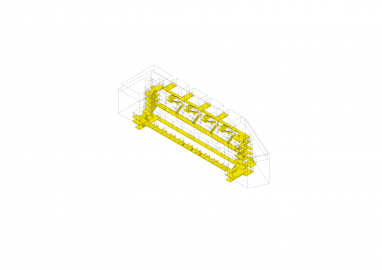 Seventeen studios and three commercial units are designed as blanks so that the different needs of individual occupants can be incorporated in the standard of fittings.